I mentioned in my post on starting up a sourdough culture that I was also having a go at fermenting sauerkraut. Though that first attempt came out too salty due to an oversight on my part, my follow-up attempt tasted delicious and was very easy to make. Crisp and tangy, I used it for sandwiches, as a side, or even just ate it for a snack. I shared a jar with one of the other researchers in the lab who said he was going to eat with some pork. The success of that experiment made me start contemplating other pickle possibilities. The idea behind a cultured pickle is simple: take a vegetable and expose a lot of surface area (i.e. chop it up) and then extract its sugars by rubbing and crushing it with salt. Once the vegetable is submerged in its brine, the lactic acid bacteria living on the vegetables start to eat the sugars and producing acid, usually over the course of weeks. Most modern day pickles circumvent this process in the name of speed, adding distilled acetic acid (i.e. vinegar) to vegetables. The vinegar itself is made by a similar process except that acetic acid bacteria actually convert alcohol, not sugar, into acid. My most recent pickle is destined for sandwiches. I julienned carrots, cucumber, and daikon radish, thinking of the pickle that forms an integral part of Vietnamese banh mi. 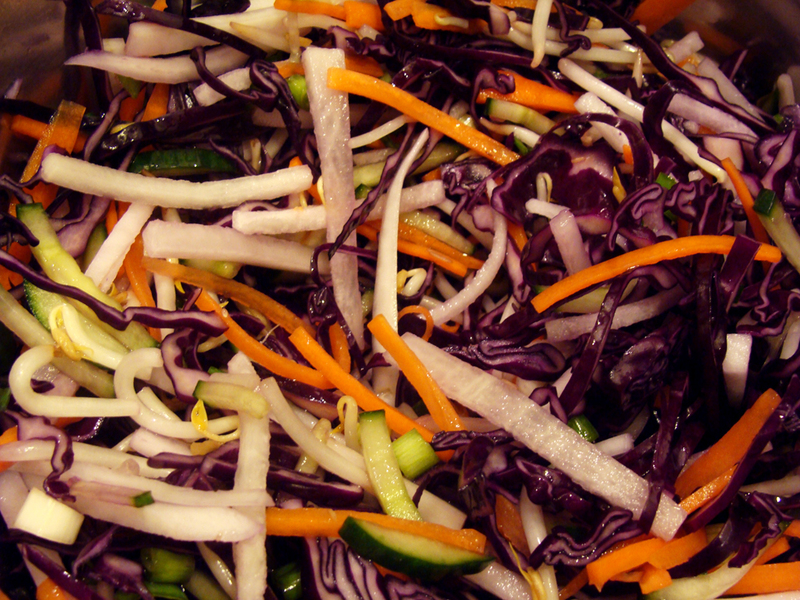 To this I added bean sprouts and thinly sliced red cabbage. Then I sprinkled in salt and rubbed it into the vegetables and until they were slick with brine and their volume had reduced. Once the vegetables have “wilted” and there is some brine forming in the bottom of the bowl, pack them tightly into jars and pour over the brine so that the vegetables are covered and close up the jars. After two or three weeks at room temperature (you can taste the pickles to see how they’re coming along), they will be adequately sour. You should open up the jars every couple days to vent any buildup of CO2 and to submerge any of the vegetables that have floated above the surface of the brine. Traditionally pickles are made in a large crock, with a plate weighted by a stone ensuring that the vegetables are always submerged, but I find my method works fine. Typically about 1/2 tbsp salt per pound of cabbage is recommended for sauerkraut, and while different vegetables have different water content and will dilute the salt a different amount, I think this is probably a safe amount for any vegetable. Not only does the salt extract juices from the vegetable, but it helps keep the vegetables crunchy by (supposedly) stiffening pectin proteins. Additionally it deters some microbes, giving your lactic acid bacteria a competitive advantage. Therefore you don’t want to use too little salt just as much as you don’t want to use too much. Keeping the vegetables submerged also helps prevent unwanted microbes like mold or yeast from invading your pickle. Lactic acid bacteria are anaerobes, while acetic acid bacteria, mold, and yeast all benefit from exposure to oxygen. By keeping the vegetables submerged you limit the ability of aerobic microbes to access the food. That said, even if mold or yeast does start growing on the surface, it is safe to scoop it out and keep the pickles. So far I haven’t had any problems with yeast or mold. 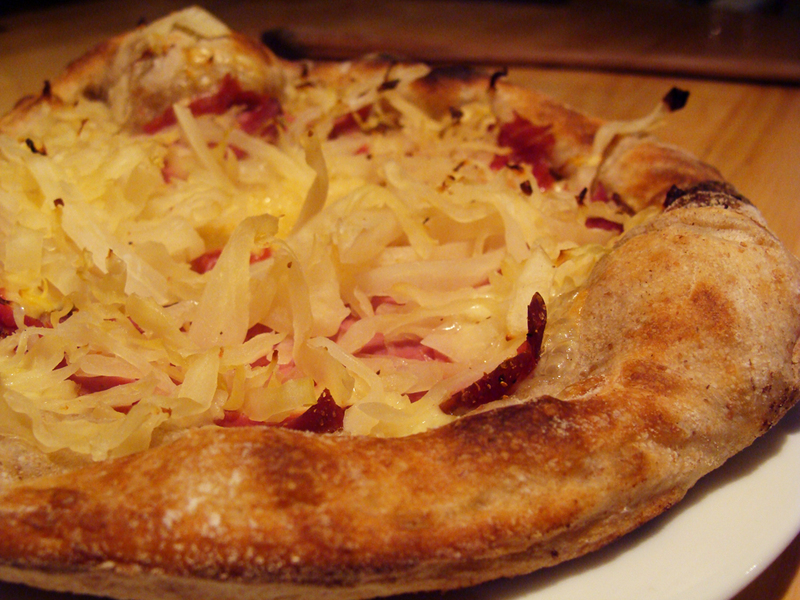 Some fun I had with my sauerkraut was making a reuben pizza. I made a dough with 30% rye flour (about the amount you would find in most rye breads) and topped it with pastrami, swiss cheese, and my sauerkraut. The tips of sauerkraut would blister and blacken in the heat of the oven, giving additional crispiness to the cabbage crunch. While it was a delicious topping combination, in truth it wasn’t so different from a reuben sandwich, except that the crumb of the crust was more tender than in your typical rye bread. Also dough made with rye flour tends to be more tacky and have less strength than dough made with white flour, and even with 30% rye the dough was much more difficult to stretch evenly and handle because it was much less elastic than what I’m used to. I have read some suggestions from people making yogurt and pickles to use whey from strained yogurt to help dose the pickles with lactic acid bacteria. My understanding is that much like yogurt cultures are not typically found in sourdough starter, pickling cultures are also a distinct group, and so adding whey won’t have any benefit for your pickles other than acidifying the brine to a pH favored by the bacteria you want to promote. I haven’t noticed any difference between my pickles which have had whey added and those that haven’t. Another variation on pickling is kimchi, a hot pickle rich in umami flavor. Traditionally kimchi is gets it flavor from a combination of lactic acid bacteria (sour), Korean chiles (spicy), and fish sauce (savory/umami). However, I opted for a vegetarian version which uses miso paste instead of fish sauce. I used the level of salt I suggested above rather than the amount suggested in the linked recipe. The basic process is the same, except seasonings such as miso or fish paste, ginger, garlic, and chiles are blended into the brine. 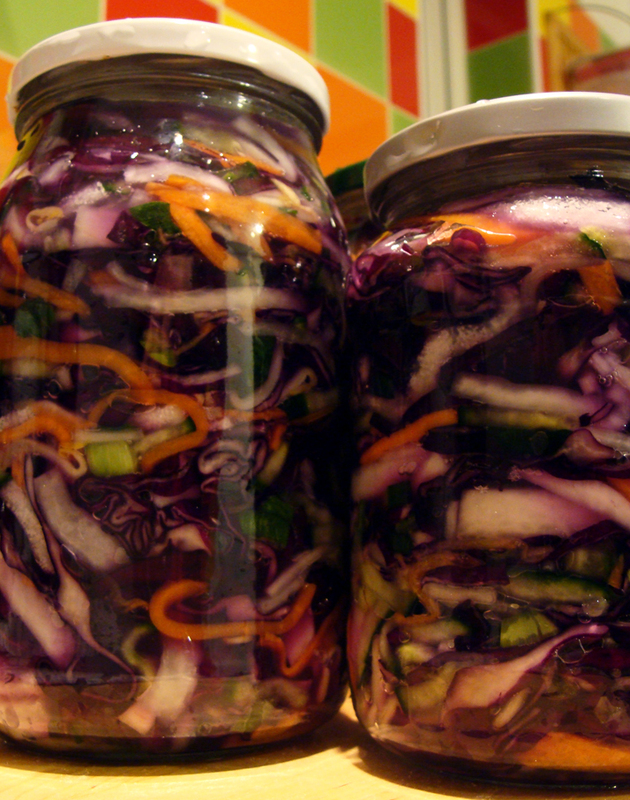 The vegetables are tossed with this seasoned brine and again packed into jars, covered by seasoned brine. 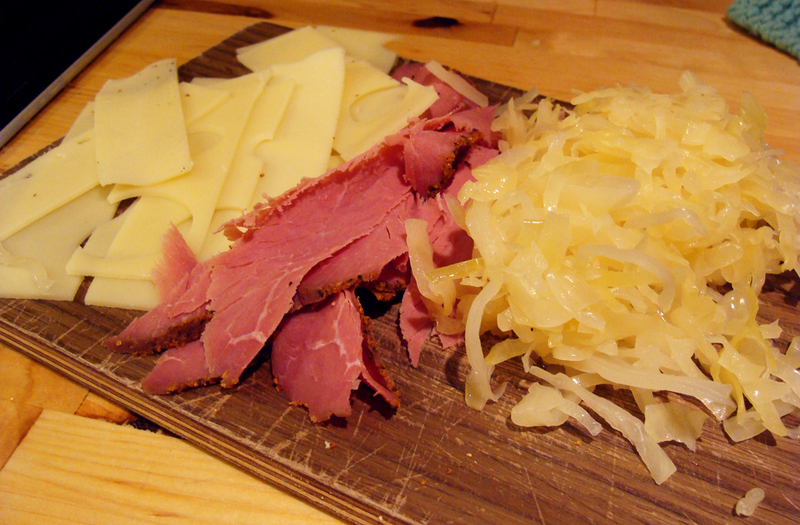 Besides reuben sandwiches and banh mi, pickles find a home in many dishes, like bokkeumbap, pierogi, and bigos. I used most of my kimchi alongside beans to make quesadillas, inspired by the creations of Kimchi Grill near my home in Brooklyn. A nice feature of having pickles on hand is that you can make a meal centered around them with minimal cooking – most of the dishes I’ve already mentioned only add a protein to the pickle and serve it on bread, over rice, or in a tortilla. This entry was posted in learning, recipes and tagged acetobacter, fermentation, fermented food, lactobacillus, pickle, whey on May 4, 2014 by Dylan Bargteil.